The Genealogy of Cities is a compilation of ancient and modern city plans, from 350 BCE to the present, depicting both built and proposed plans. Written in clear and accessible prose, it is illustrated with more than 500 plans drawn at the same scale, a unique feature of this work. It provides a previously unavailable tool for academics and professionals who must grapple with the issue of scale in researching and teaching urban design or when creating new urban spaces. 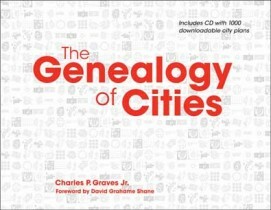 Author Charles P. Graves Jr. created these computer-generated plans to provide a method of understanding models for modern cities while also creating a series of typological diagrams for both historical periods and city fabric. Also included in this volume is a CD containing nearly 1000 plans that will allow the user to print the urban plans at any scale. General Grant by Matthew Arnold with a Rejoinder by Mark Twain presents conflicting essays and cultures. Matthew Arnold’s 1886 essay on Grant praised the general and his posthumously published Memoirs, but to many Americans its tone seemed patronizing of their hero and country. Grant’s friend and personal benefactor, Mark Twain, delivered a caustic rejoinder to the Army and Navy Club of Connecticut in April 1887. Thus Arnold became a pet prejudice of Twain’s and may have served as an inspiration for A Connecticut Yankee in King Arthur’s Court. In this volume, Twain’s rejoinder is published in a correct text for the first time since the Hartford Courant printed his speech. In November 1950, United Nations forces in Korea were stopped in their advance toward the Yalu River by Chinese Communist forces and were in danger of being overrun. Vastly outnumbered by enemy forces, the First Marine Division was cut off from its base at Wonson. General Oliver Prince Smith, commander of the First Marine Division, is credited with bringing the division and attached army units to safety, leaving no wounded behind and, in the process, destroying the effectiveness of several Chinese units. “Gentleman George” not only provides a microcosm of Democratic Party operations during Pendleton’s lifetime but is also a case study in the longevity of Jacksonian principles. In an era of intense Democratic factionalism stretching from the 1850s to the 1880s, Pendleton sought to unite the divided party around its traditional Jacksonian principles, which, when reapplied to address the changing political issues, became the foundation of the midwestern Democratic ideology.